PARIS/FLAGY, France (Reuters) - In 1789, Louis XVI summoned France's aristocracy, clergy and citizens to discuss ways to plug the crown's dismal finances and quell popular discontent over a sclerotic feudal society. Two centuries on, President Emmanuel Macron, often criticized for a monarchical manner, is also calling a national debate to mollify "yellow vest" protesters whose nine week uprising has set Paris ablaze and shaken his administration. He will launch the three-month "grand debat" initiative on Jan. 15. As during the rule of the ill-fated king, the French are already writing complaints in "grievance books" opened up by mayors of 5,000 communes. The debate will focus on four themes -- taxes, green energy, institutional reform and citizenship. Discussions will be held on the internet and in town halls. But officials have already said changing the course of Macron's reforms aimed at liberalizing the economy will be off limits. "The debates are not an opportunity for people to offload all their frustrations, nor are we questioning what we've done in the past 18 months," government spokesman Benjamin Griveaux told BFM TV. "We're not replaying the election." "Emmanuel Macron is like Louis XVI who ... receives the grievance books but doesn't understand anything from them." 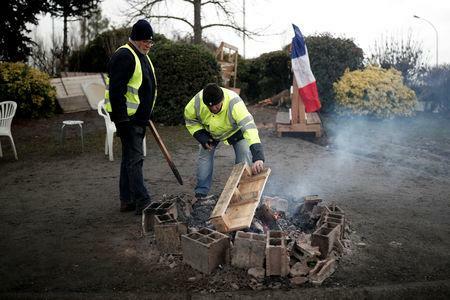 In Flagy, 100 kilometers south of Paris, the village mayor has been receiving written grievances from local "yellow vests" like Agosthino Bareto. The 65-year-old garage owner is convinced the government will frame the debate to suit itself. "All that we've been saying is like dust thrown into the wind," Bareto said. "We're not being listened to." Flagy's mayor, Jacques Drouhin, is sympathetic toward such frustrations. He says he will refuse to hold a town hall debate as long as Macron plans to press on with reforms regardless. "That's not what our citizens are asking for," Drouhin said. "That's enough. It's now down to our leaders to listen to what's been said in the grievance books." France is bracing for more street protests and possible riots when winter sales kick off this Saturday. Yet even as the demonstrations rumble on, it remains unclear whether the "yellow vests" will emerge as a political force or fizzle away, undone by their own internal differences. The leader of Italy's anti-establishment 5-Star Movement, Luigi di Maio, this week publicly backed the French protesters, offering his party's internet platform for direct democracy -- known as "Rousseau" after a leading thinker of the French Enlightenment -- to help the "yellow vests" define a program. While leaderless, the "yellow vests" mirror movements like Spain's Indignados and Italy's 5-Star, which have sought to upend Europe's traditional political system. 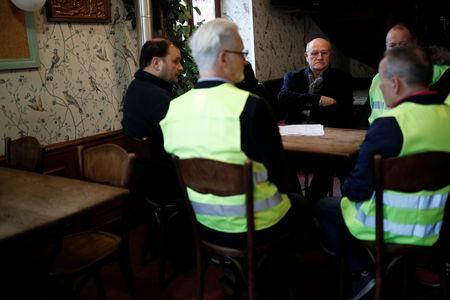 "I am more worried now about the 'yellow vest' protests in France (than Italy)," Karen Ward, chief market strategist for EMEA at JP Morgan Asset Management, told an media briefing. 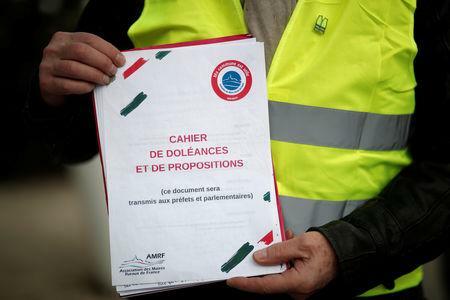 The "yellow vests" are demanding the right to call referendums through mass petitions. Senior cabinet ministers have not rejected the idea -- Prime Minister Edouard Philippe called citizen-initiated referendums a "useful tool in a democracy" -- but said their use should be limited. "The government is aware of the risks of making any vote a vote about Macron and not the issues," said Antonio Barroso, deputy director of research at risk advisory firm Teneo. "So you solve that by asking multiple questions."